If a teenager has a bad fall off a bike or a significant head injury while playing hockey, the timeline for recovery is very similar to an adult with a stroke. By 3 to 4 years after the injury, a physician can say, with confidence, whether or not there has been a full recovery. I was taught in pediatrics that I could predict the prognosis or outcome for a child with cerebral palsy by age 3 to 4 years. It took me a long time to figure out that this early judgment was wrong in at least 80% of children. The logical error that has occurred in pediatric neurorehabilitation is the application of a three to four-year timeline of recovery to a baby with a growing immature brain. Babies have brain neuroplasticity, but human children also have the advantage of developmental plasticity. It has been estimated that at age 3 years, less than 30% of the adult mature brain is wired and functioning. What we see at age 3 years is the extent of recovery from the primary damage to the corticospinal system. What we do not see is the further improvement that is only possible as the brain matures and all the other systems that contribute to adult motor function come “on-line”. Can you teach a three-year-old how to play tennis or hockey? In spite of the immaturity of the 3 to 4-year-old brain, all of the literature supports the concept that an accurate prognosis may be given for a child with cerebral palsy at this age. Trying to assign a prognosis earlier is fraught with error as many of the children, initially thought to be damaged, recovered. They demonstrated sufficient baby brain neuroplasticity to fully recover from their injury. For those that do not fully recover, there are numerous studies in the literature that have looked at the child’s severity classification at this age and the results are clear. The majority of children stay at the same level of severity or deteriorate with growth during their teen years. The problem with these studies is that they are measuring the severity of the child’s early acquired Habits at baseline and they find no change in these early acquired Habits at later follow-up. I interpret these results as excellent proof that “doing more of the same harder” does not produce anything beneficial. I have demonstrated over and over again on this site that Habit Hides Recovery… The child’s early movement patterns are abnormal because they were learned with a damaged, immature brain. Later movement patterns are learned with a recovered, more mature brain and they may be NORMAL. We walk and run with the same parts of the brain, yet in The Boy Who Could Run Better Than He Could Walk, the young boy walks with a limp and played soccer brilliantly. (see: The boy who could run better than he could walk) His brain had clearly recovered because he is able to run normally, with a four point reciprocal pattern. We do not need to teach him how to walk, we need to change his Habit. Christine, shown below, still walks with difficulty as her walking pattern is an early habit and habits are hard to change. With lots of hard work, she now jogs in the water with a perfect four point reciprocal pattern and is learning to move across the tennis court. I may be able to move across the court faster than her, but her forehand volley is better than mine. 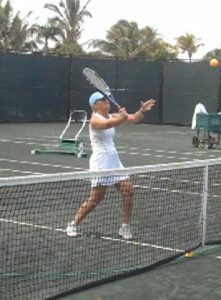 (see: Adult water exercise results and What is the diagnosis) These photos show the same woman…in the tennis picture, it is hard to think she could have any problem with movement. Over the next few months, I am going to be exploring what parents and therapists and doctors can do to limit the severity of early maladaptive or “bad” habits while the brain recovers. This is really the work of the first four years of life. Then we’ll start to talk about how to change established habits. Most of what I’ve learned about changing habits has come from my exposure to excellent coaching in my youth and studying the new information available in the fields of exercise science and kinesiology. Much of what I’m going to discuss is obvious to people who have played competitive sports and received good coaching. Unfortunately, it is news to most health scientists and practitioners. To me, it seems like 3 to 4 years is a really long time. Just think about all the skills and functions a child learns in the first 3 to 4 years of life. It explains a lot to know that my child learned all the basic foundational movements with a damaged brain. She now has bad habits ingrained in all her basic foundational movements. Is it possible to learn a new movement and have that movement be normal when it is based on an abnormal foundational movement? I am really looking forward to the upcoming posts. Thank you for the question. It is a good one. Yes, your daughter learned all her foundational movements with a damaged brain, but the important point is that it was a damaged brain in the process of recovery. Depending on the extent of initial injury, the recovery process may be complete at any time in those first four years. How you tell whether there is recovery or not is to “catch them doing it righ”t. If your daughter can sit normally at any time then she has the neurologic capability of sitting normally. The fact that she might often sit with a slouch or with extraneous movements, is evidence of her Habit dominating. This holds true for walking or hand use well as speech. If they EVER can do it normally, remember that the brain has recovered sufficiently for them to do it normally all the time. It takes time and effort to improve consistency and this can be tough with young children. I will be talking more about it in future posts. Unfortunately, I am no longer in clinical practice and can only reply in very general terms to your questions. I think you would be best to talk with your neurologist about your concerns. As well as seizure management, you could ask to see a therapist who could give you some good ideas on how to help your daughter. Dear Tantane, up to 80% of children with cerebral palsy do walk and 60% walk unaided. So the odds are good, but getting good physical therapy is needed.This blog post talks about current outcomes. Ask your doctor what type of CP affects your child and then discuss with your health care team what it means for your child. Dear Anny, You and your parents will have to discuss this with your doctors and therapists. Each child is an individual and your brother’s situation sounds very complex. Hello, my name is Jacob and I was diagnosed with CP 2 weeks after my birth. I have spastic-dyskinetic-ataxic CP. I was wondering what the percentage is of children recovering to an above average state of living? In other words, how many people with CP go on to live an above average life? Jacob, I do not think that is an answerable question. Most children with CP now live a normal lifespan. 80% are GMFCS Levels I to III, 60% walk independently. I have met many that I would judge have created an above average life for themselves, but I do not know the incidence. Sorry to not be able to answer your question.